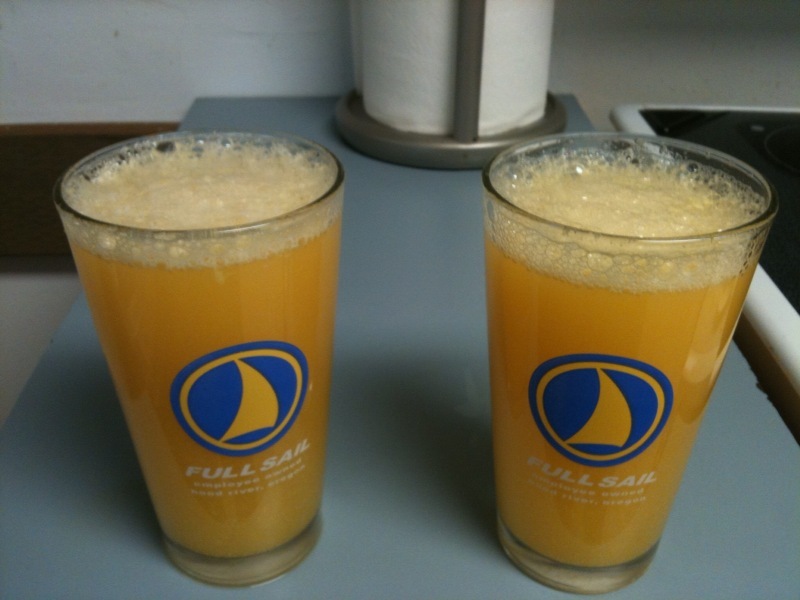 The perfect way to prepare for a long bike ride? Stay out too late the night before, drink too much, and eat pizza. 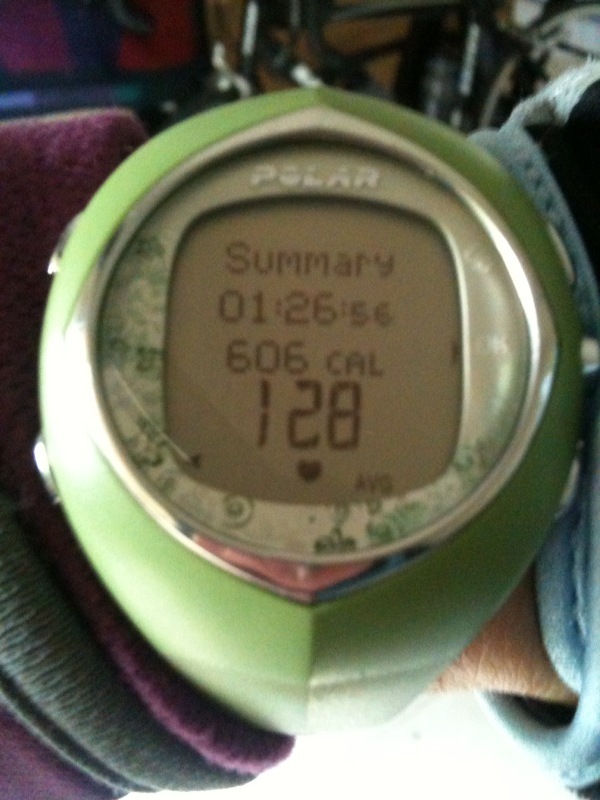 Um, yeah…I was pretty weary about today’s long bike ride when I woke up this morning. I wasn’t hung over but I was definitely feeling tired and slow. Michael made breakfast for us. 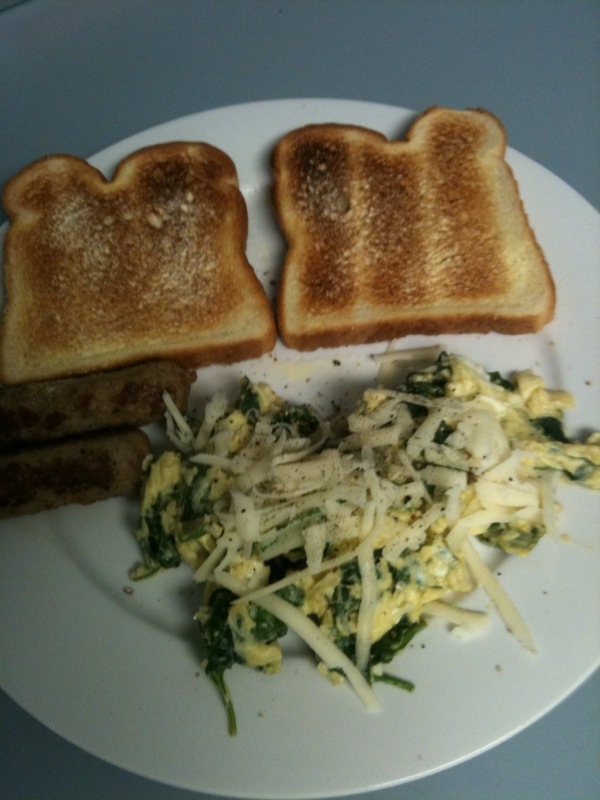 Scrambled eggs with spinach, topped with Grueyere cheese and Light sour cream, 2 turkey sausages each and two pieces of toast each. It was delicious and filling. I sunscreened myself pretty well. 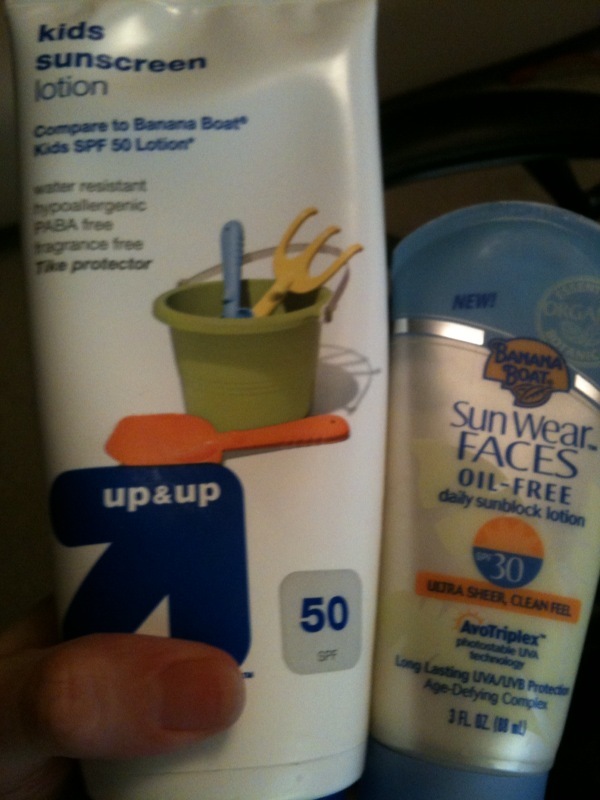 Sunscreen Even In Cloudy Weather! 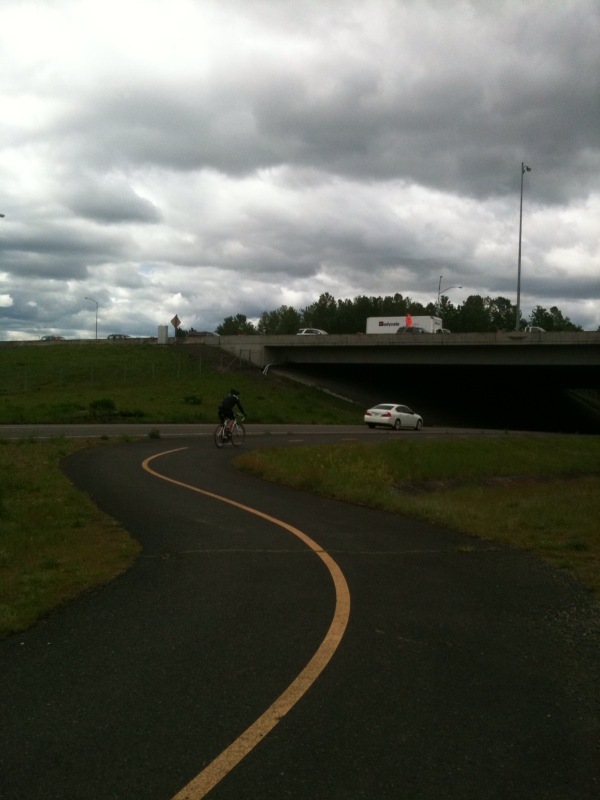 We headed out on the I-205 Bike Path North. 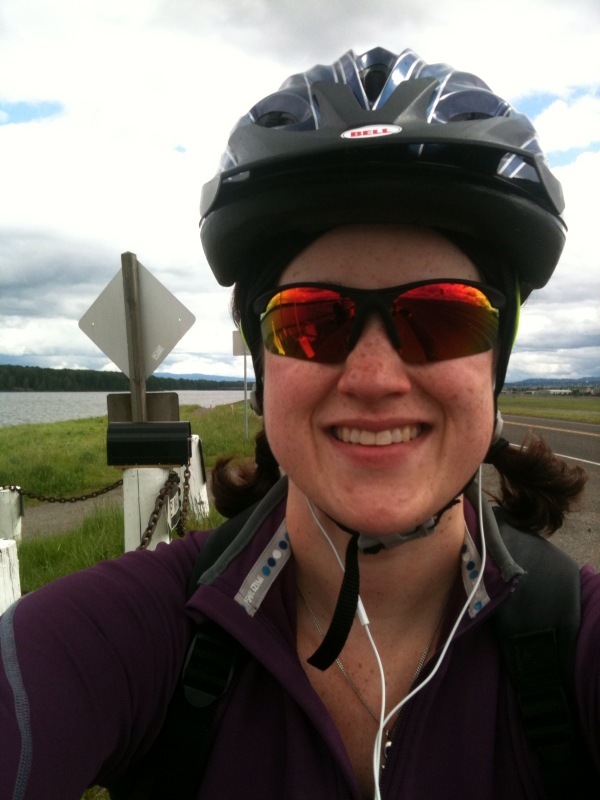 My legs were slow and I felt like I was biking through water. 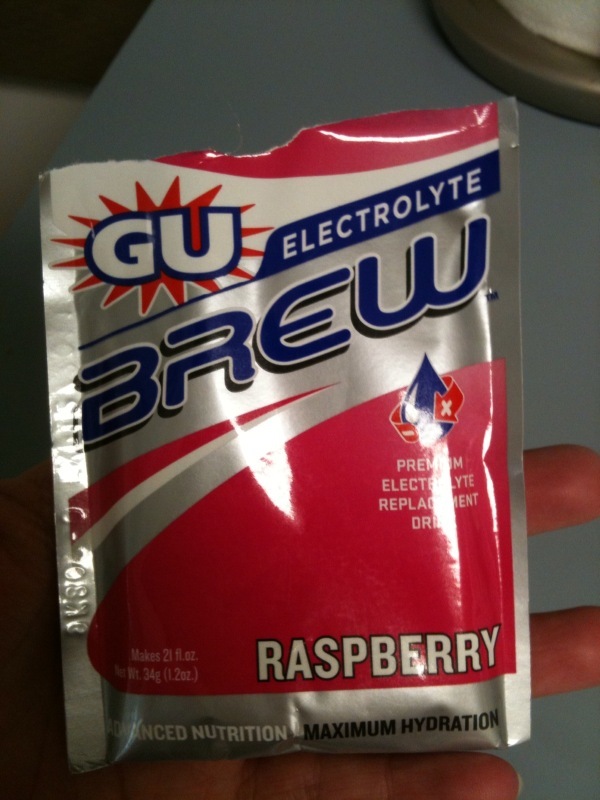 After about 25 minutes of struggling, I drank some of the GU Brew and got a little pep in my step. We stopped around 45 minutes and I ate my Sports Bean pack and Michael had a Clif Shot. He didn’t like the Clif Shot. He said it had a weird chemical taste. 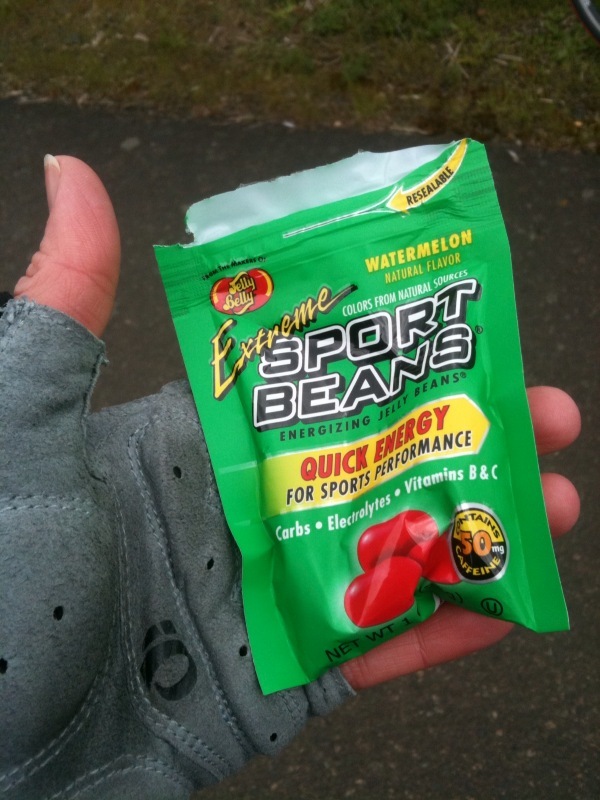 The Sports Beans were OK but I didn’t like the watermelon flavor. The weather was gray and cloudy. I dressed for rain and ended up regretting it 2 hours later. It was too hot for tights. We kept heading North on the path and for some reason the freeways were ALL backed up. Thankfully we were on bikes! We came to a fork in the trail. 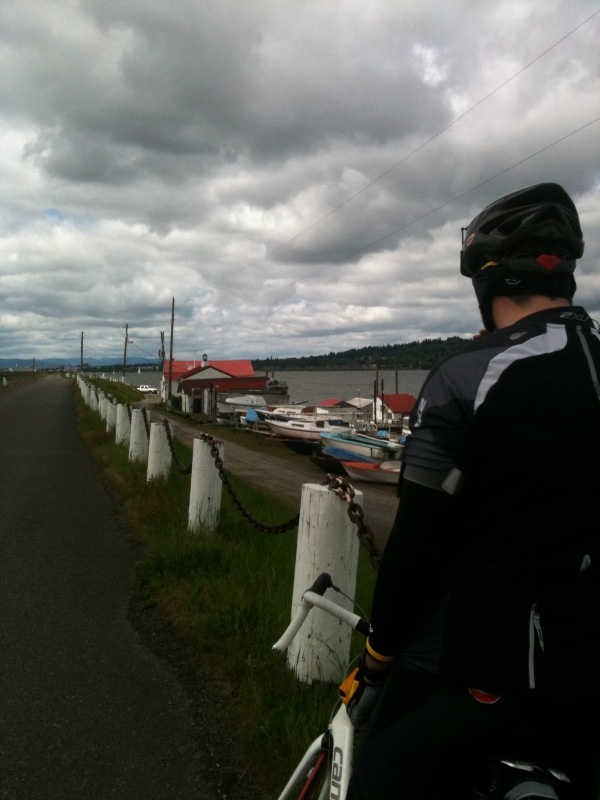 Last weekend we turned towards Washington. Today we turned onto Marine Drive. 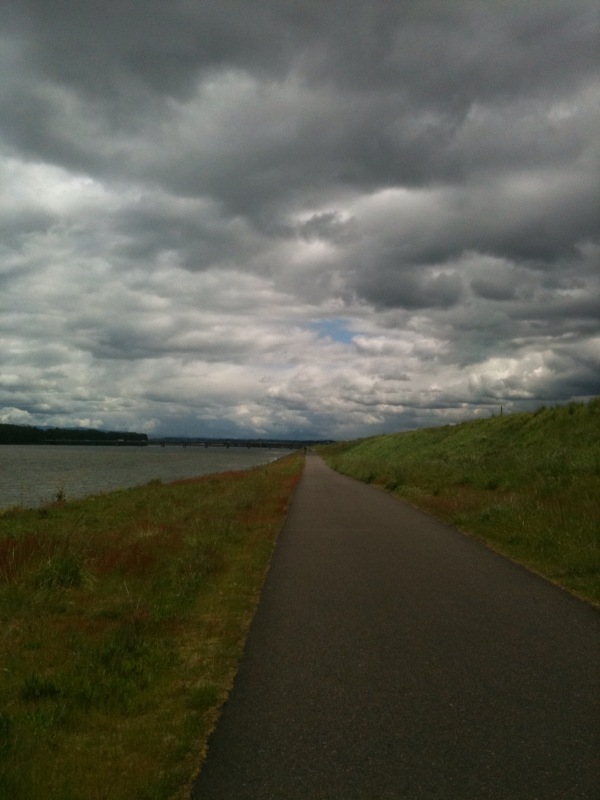 There’s a very nice, scenic bike trail that goes along the Columbia River on Marine Drive. Neither of us had ever been there before. As you can see, it was pretty gray out. Luckily, we did not get rained on at all. We rode along Marine Drive and chatted about how scenic it was. It was also very windy but we powered through it. Now for the CRASH AND BURN part of today’s story…..
We were riding along the path; Michael was a bit ahead of me. There were three people coming towards us. They had a bulldog who was running along with them as they biked. I was completely distracted by the puppy. I guess the first guy on his bike was texting ON HIS PHONE and not paying attention and veered into Michael. Michael came to a screeching stop but I didn’t see ANY of this happening and plowed RIGHT into Michael on the bike. We both went down. My handlebars got caught under Michael’s bike seat. Luckily. I fell sideways onto some soft grass/moss and my backpack broke my fall. My leg was stuck in between our bikes (since the bikes were locked together). Michael didn’t fall. A reflector from the front of my bike broke off. THE GOOD NEWS we weren’t seriously hurt and our bikes were OK. My leg got unstuck and I can tell I’m going to have a humongous bruise on my thigh tomorrow. It’s pretty sore. I stood up and tried to shake it off. 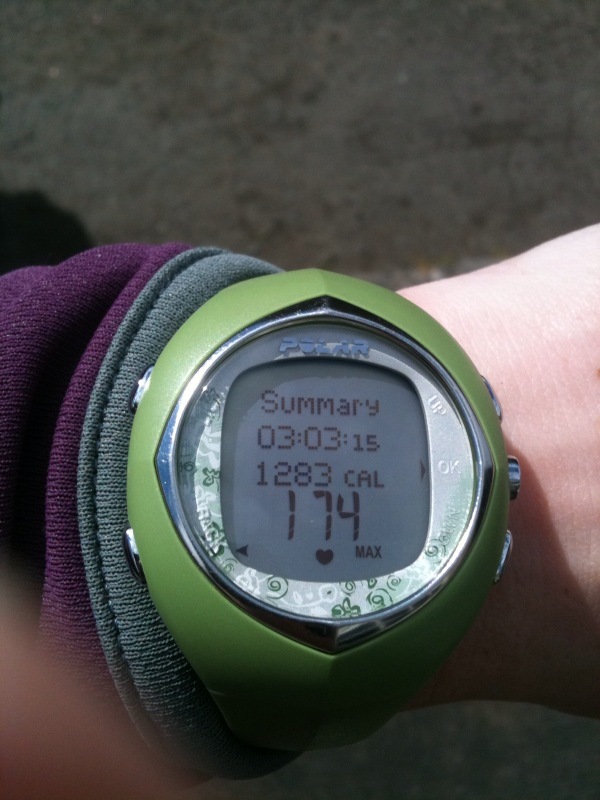 The adrenaline was of course pumping through my body and I felt all jittery and my legs and arms were shaky. We were lucky nothing serious happened, and that it happened where it did. A few feet ahead of that spot and there was no grass to break our fall–just a very scary rock ledge heading down to the water. I made sure I was alright and we got back on the bikes and continued on. A few minutes later, we got to a Marina and stopped to have some more GU. 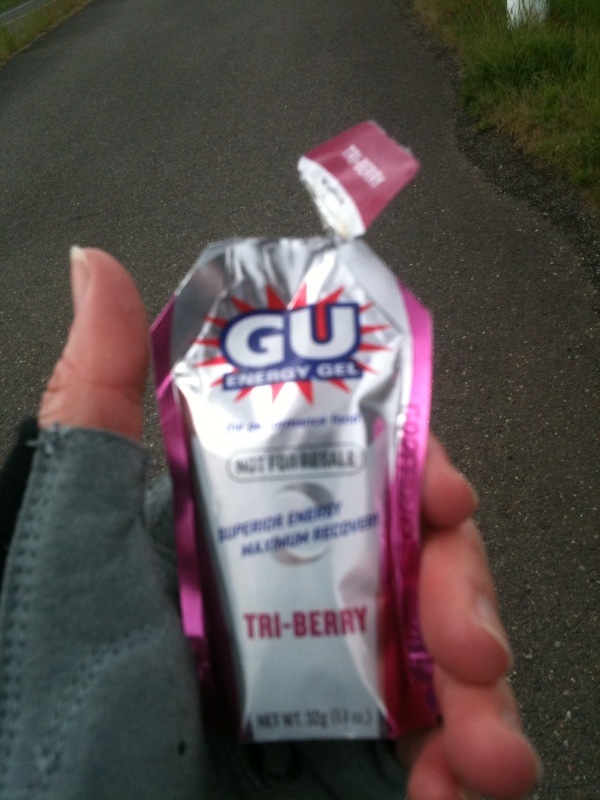 I liked this Berry Flavored GU the best so far. It was yummy. 🙂 We rested for a few minutes and tried to figure out where we were going with my iphone. Our bike ride wasn’t just for training. 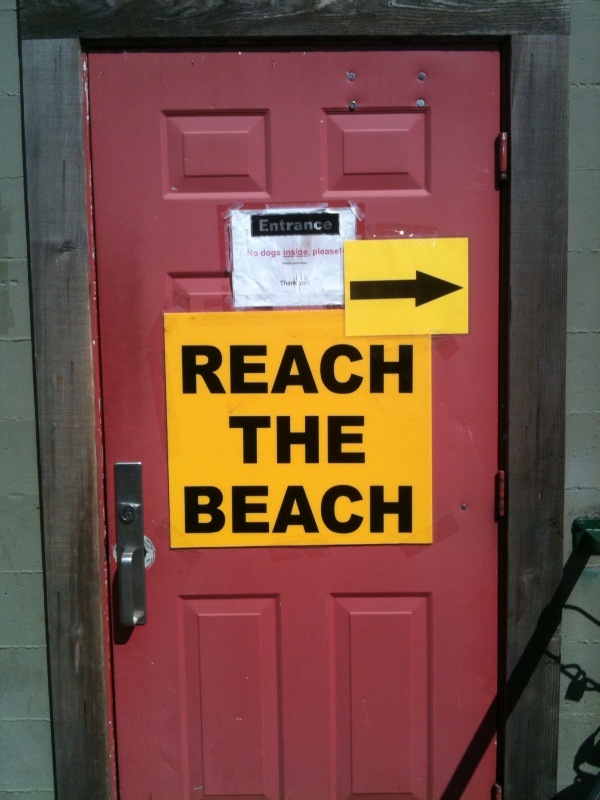 Our final destination was NW Portland to pick up our packets for Reach the Beach. The packet pickup was at the Lucky Lab from 2-4pm today only. We continued on Marine Drive. 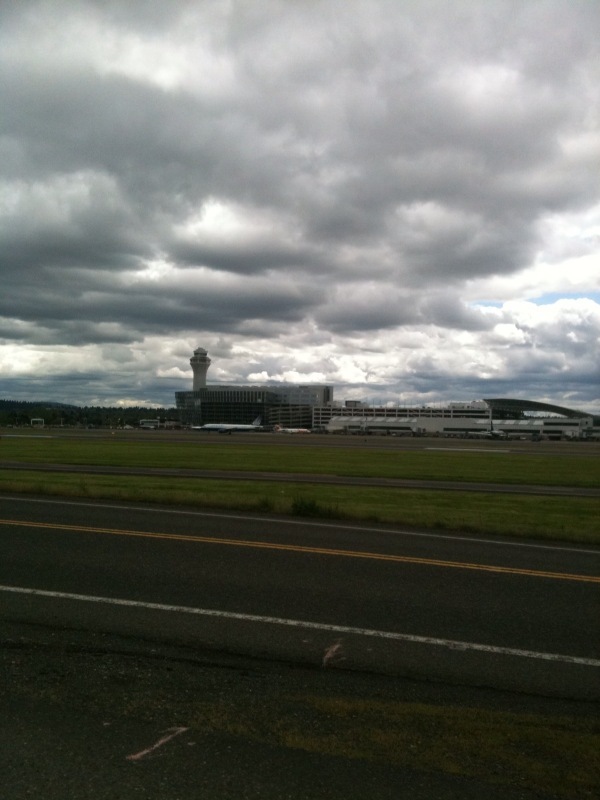 We biked passed the airport. Huge planes were taking off above our heads! 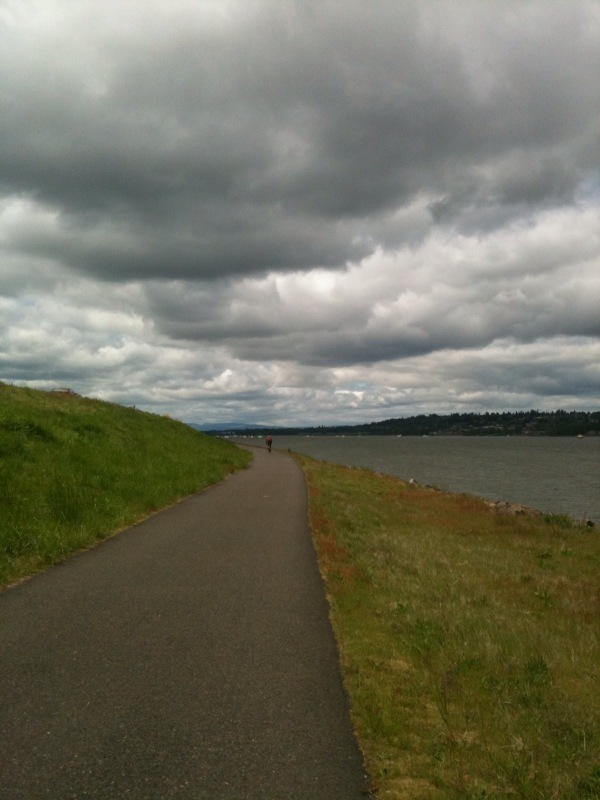 The Marine Drive Path ended and we took NE 33rd into the city. I was starting to feel stressed for time. 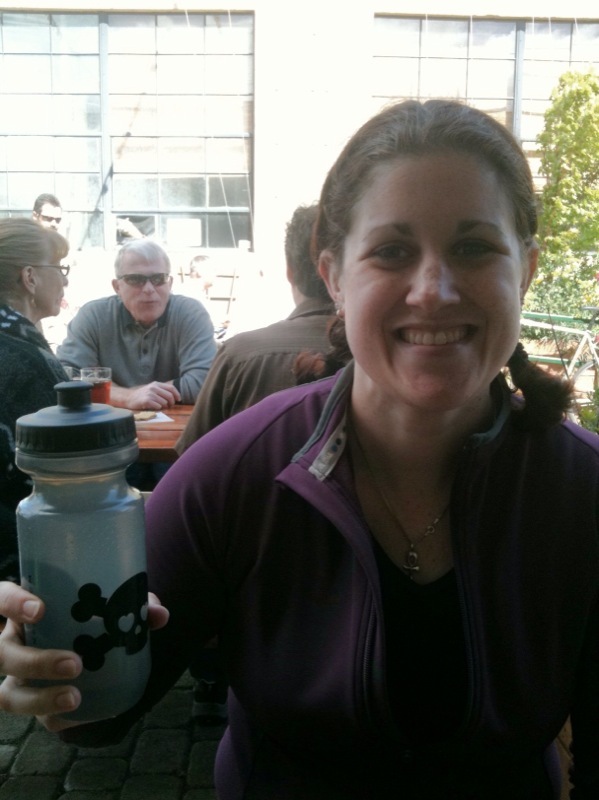 We weren’t really sure how to get to NW Portland from where we were so we rode up NE 33rd, passed the Kennedy School Pub (where we ran into some of Michael’s coworkers) and then took NE Killingsworth to NE MLK. It was frightening riding on such a busy street! We went as fast as we could. 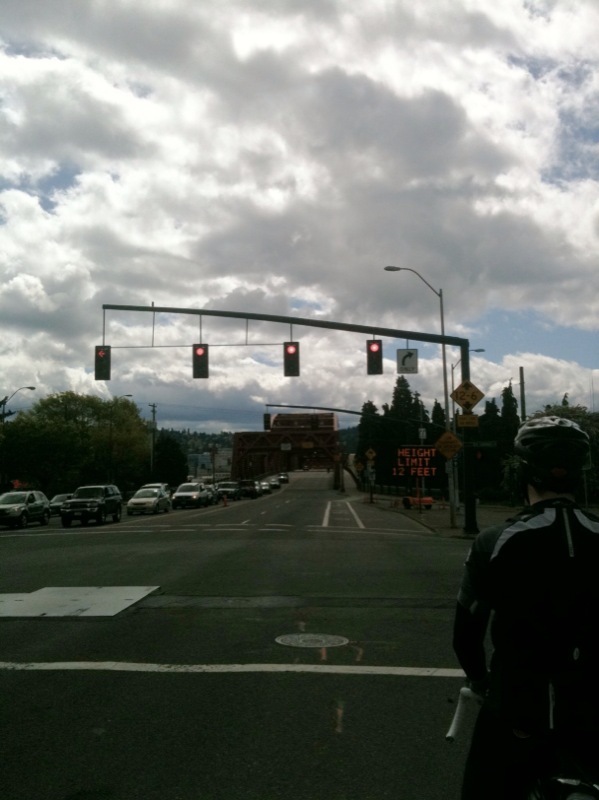 Turning onto Broadway, we rode across the Steel Bridge. 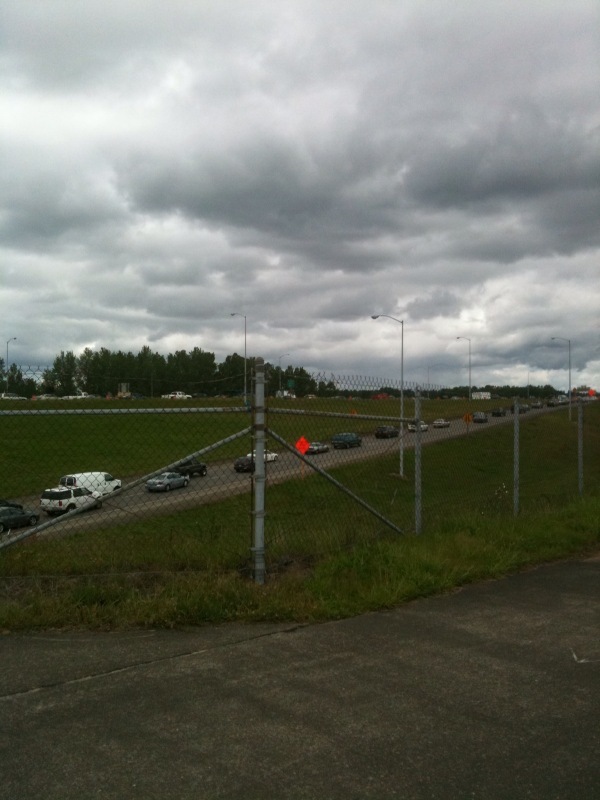 We biked in a LOT of traffic today. There were a few scary moments. But it wasn’t too horrible. 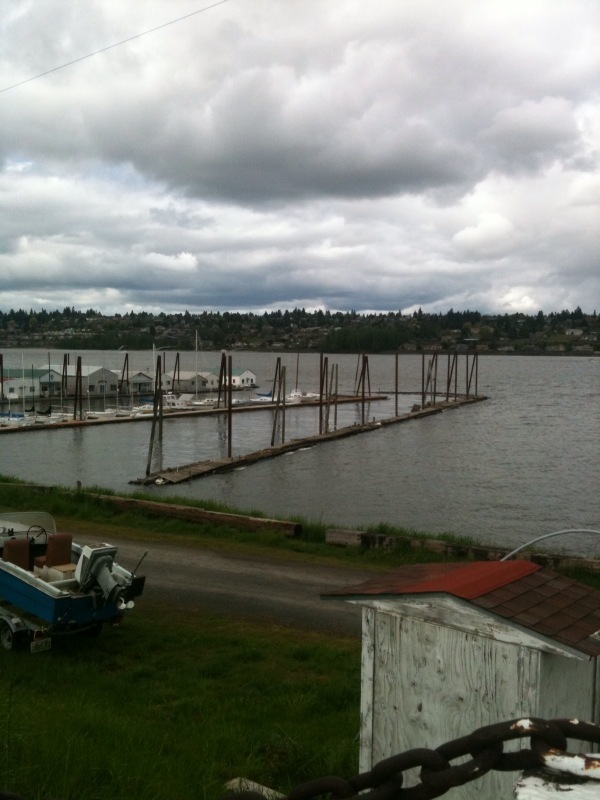 We rode across the river and into NW Portland until we arrived at The Lucky Lab. There were lines out the door to pick up the packets. While we were standing in line, a lady came by with a tray of Pepperidge Farms cookies! I grabbed 3. 🙂 We picked up all our stuff. Bibs, maps, info packets. There were snacky foods set up buffet style. 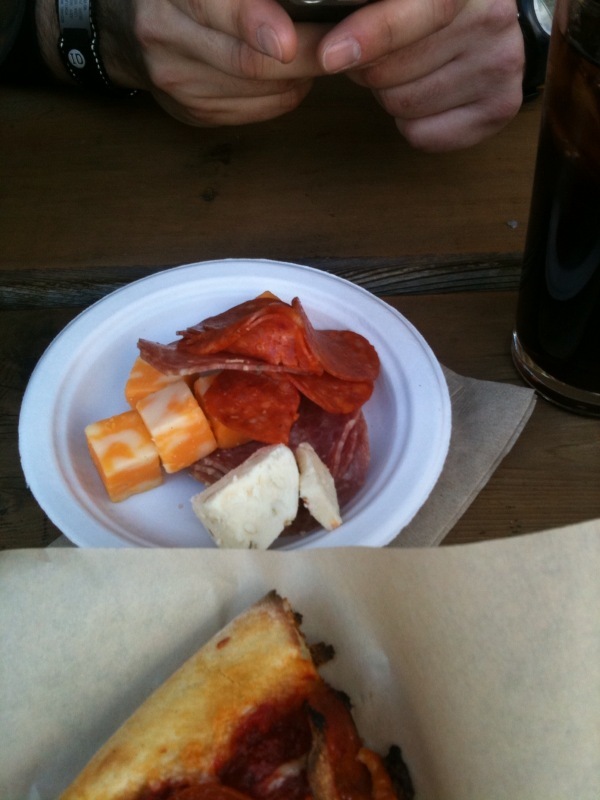 We ordered a slice of pizza for each of us and got a few snacky things to munch on while we waited. 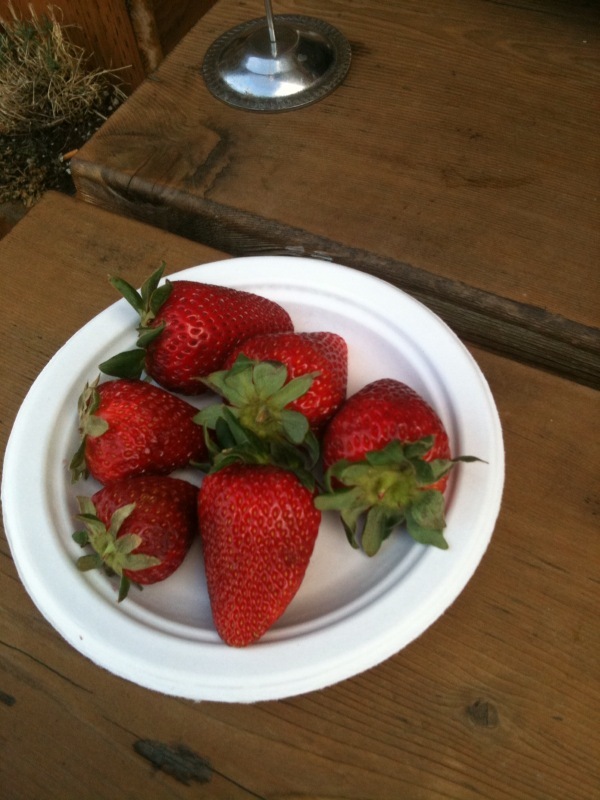 They had delicious strawberries too! 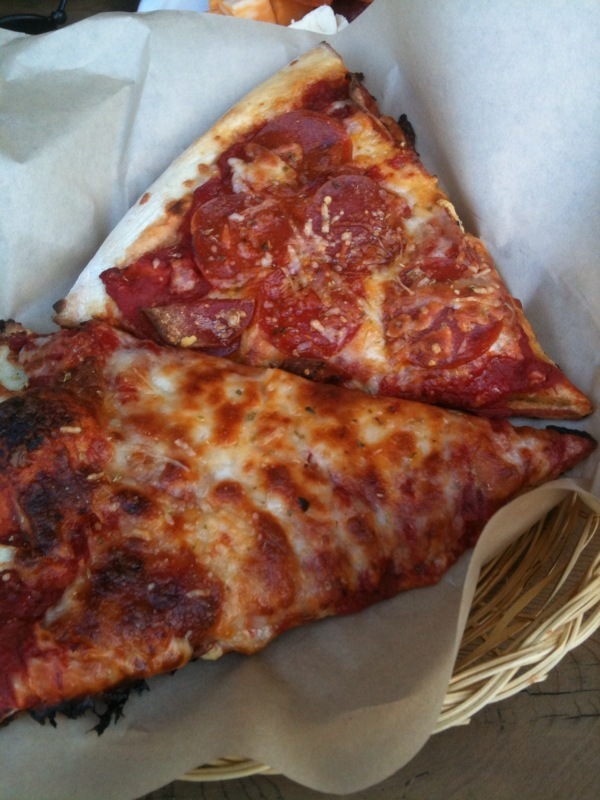 I got a slice of cheese pizza. It wasn’t the best pizza ever but we were so hungry! After relaxing a bit and letting our food settle, we hopped back on the bikes and headed home. 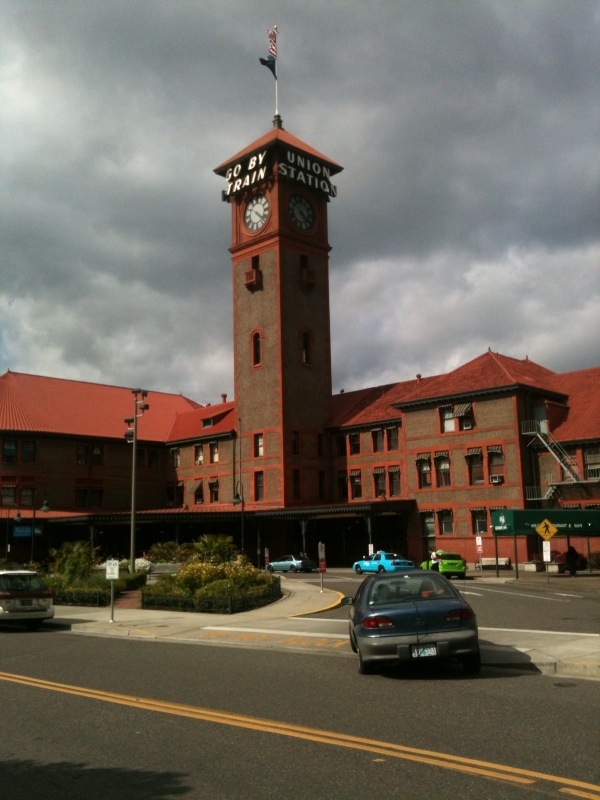 We rode through downtown Portland, passed the train station, and connected to the waterfront Esplanade (where I run at lunch). 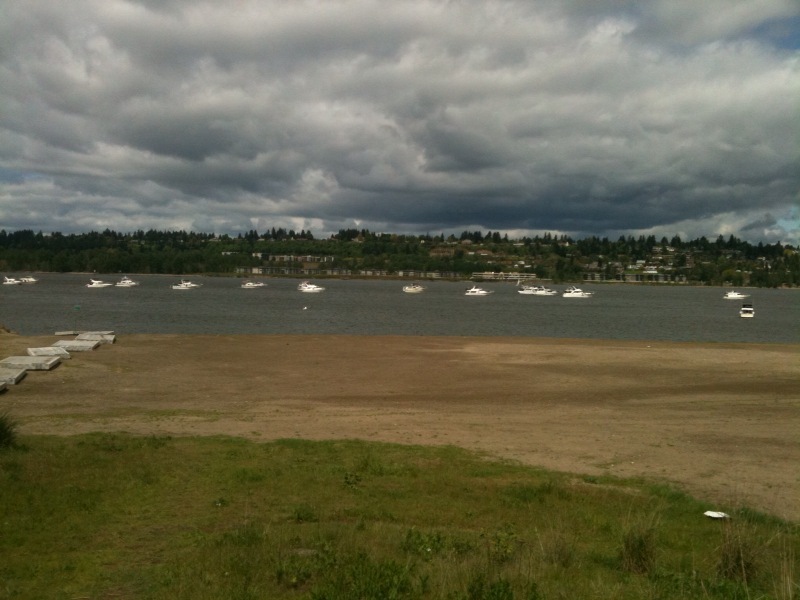 We biked on the Springwater Cooridor and then stopped at Oaks Bottom Park to use the bathroom. 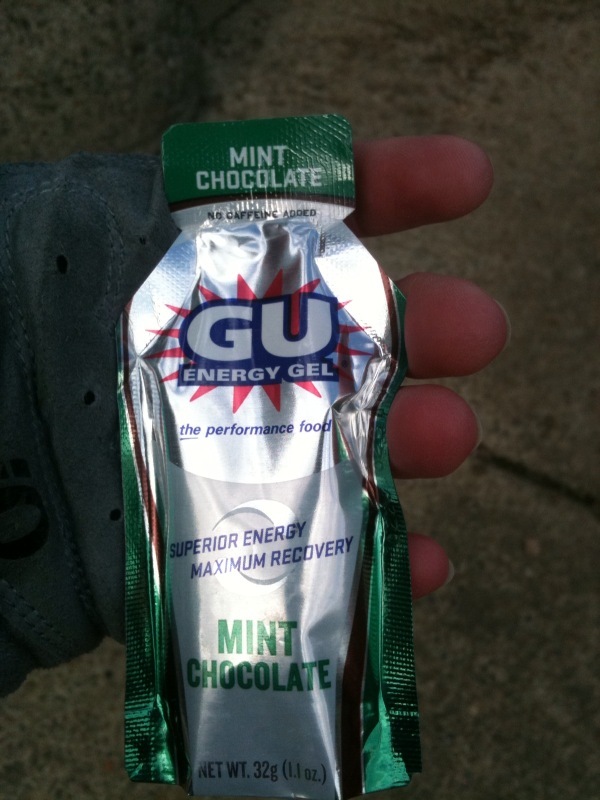 I had my last GU (Chocolate Mint-my favorite!). I needed that last big “jolt” because I was starting to slow down. We rode the Cooridor home. 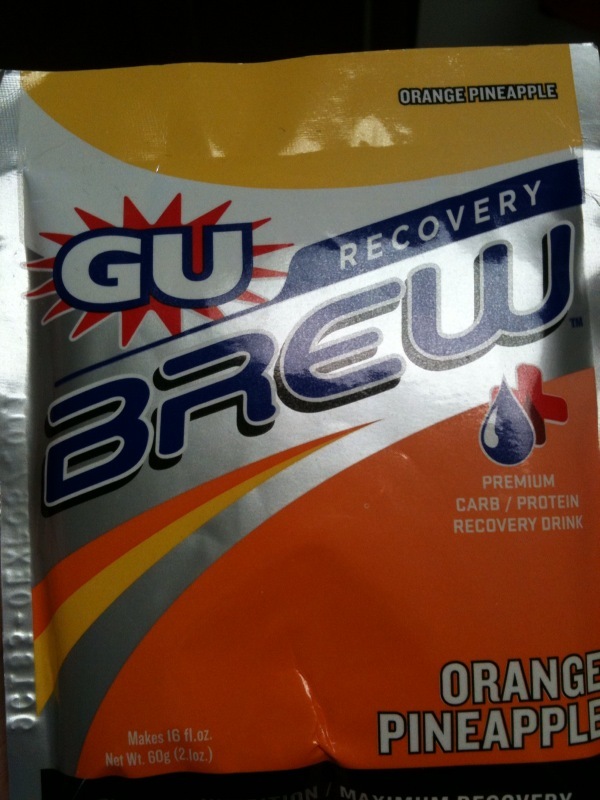 When I got home, I had a recovery drink. Wow – what a day. Glad to hear that you both weren’t hurt in the crash…they can be scary!!! Yee-ikes! The crashing! The burning! How’s the bruise on your thigh developing? I’m really impressed with your all day bike ride. It sounds like hard work, and it sounds like fun. Wow congrats on the long bike ride but what an idiot that guy was for texting WHILE riding!! Are you kidding me!?!? Also, I’ve heard those watermelon ones are a little too sweet… lemon lime is where its at!! I know! I can’t usually take my hands off the handle bars, let alone text while biking! Biking scares me. I am always impressed with cyclists. Good thing you crashed and burned into grass. BTW-congrats on your weigh in! Thanks! I’m pretty happy to finally see progress. ouch your fall sounds painful! glad you are ok. that was some intense exercise, i dont know how you guys do it!